He is limber…young, but determined. His iridescence is as alluring as his predecessors. He has been pecked, flogged, and spurred. He lacks the weaponry to prevail, but accepts his challengers as they come. No fence, creek, or thicket can contain him. He may not be the keenest foe, but he is worthy. He is…the two year old. 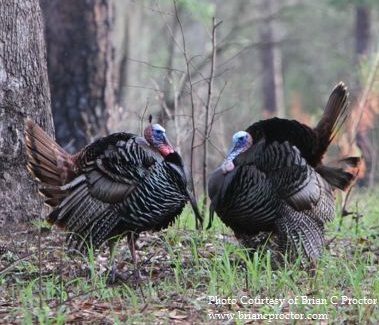 The legendary Ray Eye once said, "Spring turkey hunting is judged by a brief period when the woods are full of two year old gobbling toms and most of the hens are on the nest. Other than that, hunters say something is wrong with the turkeys, or that the turkeys are "call shy." This, to me, is a very accurate statement. Really…how often do you, or anyone you know for that matter, end a spring turkey season having harvested birds, each of which is three years of age or older? Seldom, right? I have come to learn in my experiences that the two year old gobbler is to be much appreciated. His characteristics are advanced, even with his young age. He may not be the biggest, or the baddest…but man is he fun to hunt! I have heard hunters talk about a harvest and say, “He was just a two year old.” JUST a two year old….really? It doesn’t matter how many turkeys I have harvested, when I see someone and a mature gobbler, I get a little green. However, to disrespect the experience as a whole by saying he is JUST a two year old is pure lunacy. Bring that same turkey back to life and throw him in my neck of the woods. I’ll take him any day. Any die hard turkey hunter will tell you now that, if he had a choice, he would love to have a “spur-daddy” of a gobbler sporting blades over an inch long. But take that same hunter, put him in the woods with a pair of hard gobbling two year olds half strut running into his setup, and he wouldn’t care if they had spurs to boast about. The two year old is special. Give him a couple of clucks and purrs in early spring and be ready for a heck of a show. He is a sure confidence booster when you’re in a slump, no doubt. He will gobble a hundred times on the limb and fly down when you can barely see. There are no two ways about it. If a two year old bird proceeds into gun range, well…you know. We are so blessed to be involved in such a wonderful sport, but even more blessed that when a juvenile gobbler becomes mature that he is not automatically the sharpest tool in the shed. When it comes to turkeys, maturity is maturity. A two, three, four or even five year old bird is a mature gobbler. Though a two year old doesn’t sport the exact same hardware or number of spring seasons under his belt, he gobbles hard, he struts, and he succumbs to decoy setups and any style of calling! I can sit and talk about how wonderful it is to hunt the two year old bird, but here is the thing. There is a reason the older birds are so hard to hunt. The two year old is easily trained. He will only have flaws in his judgment one time. The hunter ultimately decides if he will fall because of it. Over call him, let him bust you, or miss…and he may be the reason you seek out the younger birds on that property for the next several seasons. I have educated more turkeys than I have harvested, and I have harvested more two year olds than any other age class of bird. The reasons I passed up those jakes the year before are crystal clear when I hear drumming just minutes after a gobble. I do not discriminate against taking the younger birds because they are what give us the confidence to continue hunting. The way they vocalize and approach are the way we want to see it go down every time. And if it did, it would never, ever get old. When it comes to turkey hunting and turkey hunters, I don’t know of a more privileged demographic. Sometimes we, as hunters, lose sight of what really matters. It’s not the quantity. Heck, it’s not the quality; it’s simply just being able to do what we love. And every now and then, a hunter will step in the woods and strike a gobbler in the pre-dawn darkness, and may be just lucky enough to go one on one with the two year old.